I am planning a moose hunting trip the last two weeks of September and I have never hunted this time of year. Can you offer some moose hunting tips please? I would gather... lots of calling. I'm worried about heat and bugs and the moose not coming out. Thanks for the question Keith. Early season moose hunting can certainly offer its challenges, but this time of year can also bring some very exciting moose hunting experiences. I assume you are planning your hunting in British Columbia? The moose rut in BC peaks the first two weeks of October, this is why in the BC limited entry hunting regulation synopsis there are distinct seasons placed around the beginning of October. For many years I hunted the same two weeks season you refer to. But it is the types of calls that will make the difference in timing the season before the moose rut. Cow calls have the most effect during the peak period of the rut. Bulls will be active and looking for mates. If the rut is late or hasn't started you should try more bull moose calling. What I mean is; during the early season, bull moose will not be as active seeking females. Oh... but they are up for a challenge. Pretending you are a bull and mimicking those sounds will surly bring in a bull looking to find out who this new challenger is in his territory. Try bull grunts as well as rattling a big set of antlers. Rattling is not a technique reserved just for deer hunters. The sound of antlers crashing deep in the forest will bring the curious bulls around to see what the fuss is about. After all there may be unattended cow moose waiting to be mated with. All that said, I have successfully called bull moose (you can too) using cow calls as early as the first week in September. If the rut starts early and/or you are able to convince a bull you are indeed a cow moose in estrus... let the fun begin. 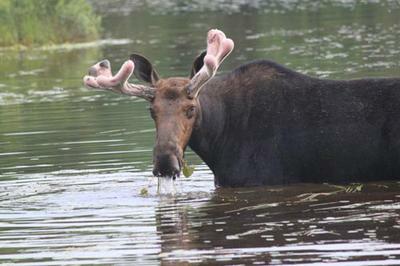 Heat and insects can make things uncomfortable for both you and the moose population. Moose do not like the extreme heat and will seek out the thick, dark and cool areas of the forest to stay cool and away from bugs. Read how the heat affects moose, heat stress plays an important part of moose habitat. Therefore if it is hot, don't expect to find any moose coming out into the open areas... you will have to go find them. Once you locate the general area where the moose are... then you should try calling. There are more moose hunting tips to be read throughout this website. Dave and Robbie... thanks for your input guys. It is always helpful to get another hunters perspective... and their moose hunting tips. Mark is right about the bulls looking for a challange. Bulls will be setting up in their respective breeding areas. You will often hear them right at dusk grunting. Often it is a series of three grunts fairly close together. I have had bear hunters think they are hearing an oversize bull frog. If you can locate one of these areas and go in a challenge him into thinking you are another bull setting up house it won't be long before he shows up looking for you.